Historic gold mining town with a large number of interesting buildings. 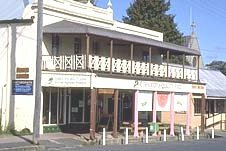 The town of Braidwood is located 279 km south of Sydney via the Hume Highway, 109 km east of Canberra and 60 km west of Batemans Bay. It is 650 m above sea level. Prior to European settlement, the area was occupied by the Dhurga Aborigines. The first Europeans into the area were William Kearns, William Packer and Henry Marsh who travelled through the district in the summer of 1822. They described the land as suitable for settlement and in the next two years a number of people moved into the district. Of these people the most important, as far as the town’s name is concerned, was Dr Thomas Braidwood Wilson, a surgeon who had been granted land in the area. When the site for the future township was chosen in 1833 part of Wilson’s ‘Braidwood’ farm was resumed by the Government and consequently the town was named after the farm which, in turn, was named after Wilson. It was surveyed in 1839 and the first land sales took place in 1840. During the 1830s Braidwood and the Braidwood district flourished as sheep, cattle and horses grazed on the rich grasslands. By 1841 there were some 1500 people living in the district and Braidwood farm had a population of 127. The town grew dramatically with the discovery of gold in the Braidwood-Araluen district in 1851-52. The excitement attached to the discovery of this gold is well captured in the book ‘Moruya … The First 150 Years’: ‘Alexander Waddell and Harry (‘the Blacksmith’) Hicken, both settlers along the Deua River, had rushed off to the gold strike at Ophir. There they learned the ‘Diggers’ Cradle’ method of gold recovery used by the Lister brothers, and soon realised that the same type of terrain existed in their own valley at home. ‘They returned and set up a cradling outfit at Sweeney’s Flat, Kiora, following the same terrain up through the Araluen Valley, and reported their finds late in 1851. ‘It took only a few months for some fifteen thousand men to come, hoping for a share of the wealth of the Araluen Valley where Andrew Badgery had previously established a station. ‘The influx of people had really begun. There was an amazing expansion of trade, of people to help with food supplies, of communication and just everyday needs. Land development occurred from Narooma in the south into the mountains in the west to Araluen and Nerrigundah, north to Braidwood and across to Bateman’s Bay’. The largest gold discovery in Braidwood was a huge 350 pound (170 kg) piece which was 67 per cent pure gold and was found at Braidwood in November 1869. Inevitably the gold rushes brought with them the bushrangers. The Braidwood area became one of the wildest and the most infamous of all of the goldrush areas with both the Clarke family and Ben Hall regularly holding up gold consignments out of both Braidwood and Araluen. Braidwood played a central role in the capturing of a number of bushrangers because it was the administrative centre of the southern goldfields of New South Wales and was the headquarters of the New South Wales police force (Southern Division) during the dubious reign of the Clarke gang. Braidwood goal had been the scene of a daring escape by the bushranger, Tom Clarke. It has been suggested that he was assisted by a warder when on 3rd October 1865 he clambered over the Braidwood goal walls and ran to a racehorse which and been tethered nearby. He managed to successfully escape and subsequently organised the Jingera mob who became a well organised and well known gang of bushrangers in the local area. The adventures of the Clarke gang reached a high point in the late months of 1864 and early 1865. Tom Clarke stuck up the Araluen mail and robbed a number of travellers between Braidwood and Moruya in January 1865. Out of the events immediately following this robbery came the shooting of Constable Miles O’Grady of Nerrigundah and perhaps most infamously the Jingera Range murders of four special constables who had gone to try and capture Tom Clarke. All these events are recorded in various monuments around Braidwood. Eventually the Clarkes were captured on the 27th April 1867 some miles south of Araluen. Throughout the later half of the nineteenth century Braidwood continued to prosper. This was the time when the impressive police residences in the town were built and the local Court House was constructed. Today Braidwood is a charming historic township with a large number of significant and important historic buildings. The first stop for everyone wanting to explore Braidwood is the Museum located at the northern end of Wallace Street. This Museum has excellent brochures and books on Braidwood and the surrounding area. It provides detailed maps listing as many as 25 historic buildings within the town’s central district. The best way to explore Braidwood’s historic buildings is to start on the corner of McKellar Street and Wallace Street and proceed south to Lascelles Street then head east to Elrington Street and complete the circuit by coming up that street and back to McKellar Street. Located at 185 Wallace Street this sandstone and brick building with its gabled roof was constructed in 1835. It was used by the Australian Joint Stock Bank until the 1850s and later became the Braidwood Council Chambers. Located directly over the road from the AJS Bank, the Historical Society Museum building was built by Surveyor James Larmer in the 1840s. It was initially used as the Royal Hotel. In 1870 it was sold to the local branch of the Oddfellows and remained the towns Oddfellows Hall until the 1960s. It is now an integral part of the town’s main street. When it was originally built it must have dominated the townscape. This handsome Victorian three-storey rendered brick building is another dominant structure in Wallace Street. It is characterised by impressive cast iron columns and decorative lace work on the second-storey balcony. The original balcony was roofless and had simple timber balustrades. Next door set in mature gardens are two red brick single-storey police residences dating from around 1880. They have hipped roofs of corrugated iron and their windows are topped with flat brick arches. Braidwood’s first court house was constructed in 1837 by Dr Wilson. This handsome Court House, built in 1900, is a classic example of a Federation single-storey brick building. It complements the nearby police residences and is characterised by four Doric columns. Built between 1856 and 1870 out of local granite this impressive building is noted for its huge bell which according to some can be heard at a distance of 15 km. It has been suggested that the bell was intended for St Marys in Sydney and somehow ended up in Braidwood. The church is located on the corner of Wallace and Lascelles Streets. The town’s other main church is St. Andrew’s Church of England located in Elrington Street one block away from the main street. It was designed by Edmund Blacket, the man responsible for the quadrangle at Sydney University. This church is particularly interesting in that it is almost certainly a combination of the creative efforts of Edmund Blacket and his son Arthur Blacket. 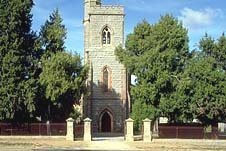 Braidwood has a number of sites that worth investigating if you are interested in the bushranging history of the area. (a) At the extreme southern end of Wallace Street is the Braidwood cemetery. In the cemetery is a large and distinctive monument. This monument commemorates the deaths of the four men killed by the Clarkes at Jingera. The men were originally buried under sheets of bark but there was a public outcry and their bodies where removed and reburied under this impressive monument. (b) The ruins of the Braidwood goal can be seen at the very northern end of Wallace Street once you have crossed the Gillamatong Creek on the way to Goulburn and Canberra. It was from this location that Thomas Clarke escaped in 1865.